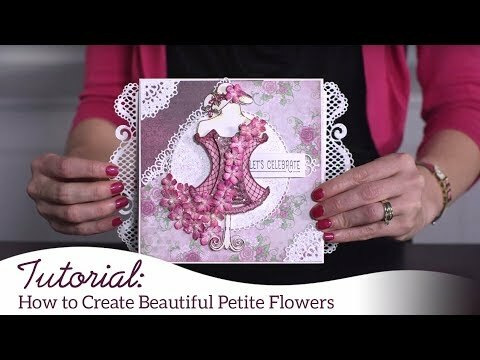 For more tips on creating with the Floral Fashionista collection, watch the tutorial at https://youtu.be/9V6JOqdQtC8. Instructions: Card size 6"x 6" (final Size). Adhere pattern paper from the Floral Fashionista Collection with distress edges. Cut two dies from Ornate Pocket Accents Die on white cardstock and adhere them as seen on the picture and then sprinkle crystal clear glitter. Stamp wonderful dress form image from Floral Fashionista Cling Stamp set on white cardstock using archival ink-plum and cut it with coordinating die and color the edges with archival ink-sunflower and color the image using Zig Clean Color Real Brush Markers and adhere it with foam circle to give some dimension. Stamp one corset from Floral Corset Cling Stamp Set on white cardstock with archival ink-cactus flower and cut it with coordinating die and adhere them with Designer Dries Clear Adhesive. Stamp some flowers from Floral Fashionista cling stamp set with archival ink-cactus flower and leaf green and cut them with coordinating die and color them with archival ink rose madder and cactus flower and leaf green and shape them with Petite Florals 3D Shaping Mold and then add stamen at the centre and sprinkle crystal clear glitter using Designer Dries Clear Adhesive. Stamp a few flowers from Classic Rose Cling Stamp Set with archival ink-cactus flower and cut them coordinating die and color them using archival ink-cactus flower and leaf green and shape them using 3D Rose Shaping Mold and using Groove Golf Tool Set also. Create one medium size rose and two small roses. Sprinkle crystal clear glitter using Designer Dries Clear Adhesive. 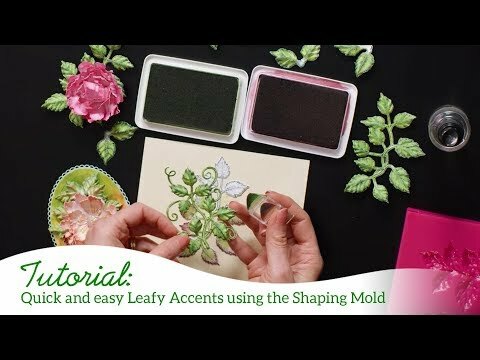 Stamp some Leafy accents on white cardstock using archival ink-library green and cut it with coordinating die and color them with archival ink-leaf green and shape them using 3D Leafy Accents Shaping Mold. Stamp some leafy spray from Lush Lilac Cling Stamp Set on white cardstock using archival ink-Library green and cut them with coordinating die and color them with Leaf green. 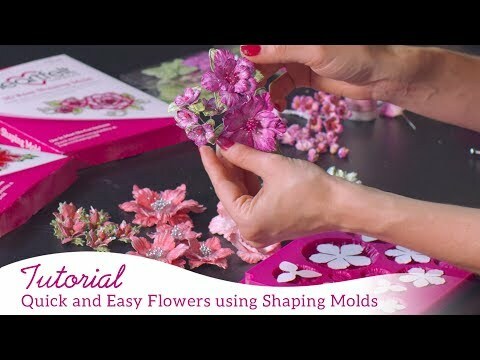 Shape them using Deluxe Flower shaping kit. Arrange all these elements as shown and add sentiment from the paper collection.